Today in the Philippines, it is declared a National Day of Mourning. Yesterday, it’s kind of a bit weird to wake up with two news headlines – Venus Raj bagging the 4th runner up title in Miss Universe pageant and then the hostage drama in Manila which took the lives of 8 tourists. How should one ordinary Filipino feel about these events? Remember that it is every person’s right to condemn what happened in Luneta last Monday, but that is not enough to denounce our country and the rest of our countrymen just because of that. There are lapses in the way the hostage taking was handled – our government has duly acknowledged and apologized for those shortcomings. There are government officials who were expected to execute their duties in a more appropriate and tactical way than what they have done – our government has already started relieving those responsible from their duties. Our people have shown their sympathies, our people are also hurting. I have seen in the television the sister of the hostage taker where she asked for forgiveness on behalf of their whole family. I have seen masses offered for the victims and their families. I have seen the caskets of the victims draped in white, with flowers and a note from Filipino nation asking for forgiveness. A high level delegation, headed by no less than the Vice President of the Philippines will be sent to Hongkong and Beijing to personally express our condolences and provide initial reports on what truly happened during that fateful day. I guess, the bottomline is – we are taking accountability on what happened and I believe that’s what truly matters. We are a nation who knows how to bow down our heads, not because of shame, but because of sincere sympathy. 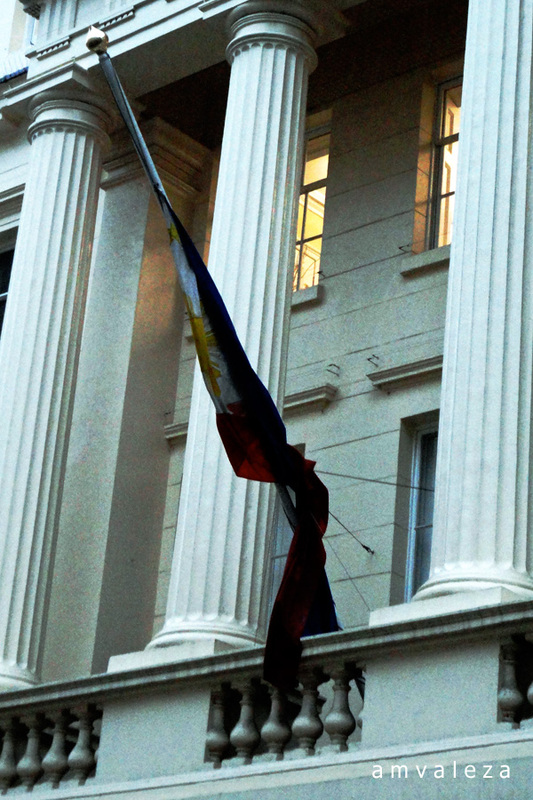 Today, I went to the Philippine Embassy in London and though I know that it will already be closed by the time I reach their office, I still went. I want to see our Philippine Flag in half-mast, as Philippine embassies all over the world are asked to also observe this day of national mourning. In the midst of chill and rain, to show my solidarity to everyone back home and all OFWs who might be suffering from silent persecution, I stood in front of our flag and silently offered prayers for the victims, their families, but most of all for my beloved Philippines. We’ve been hugging the headlines for various reasons lately, but those are the very reasons that define us as Filipinos, warts and all. We have to accept the good and do something about the bad and the ugly within and around us. Hope you are okay there. Take care.